Whisk together first 5 ingredients and brush liberally onto the salmon. Marinate for about 15 minutes. Heat a saute pan over medium-low heat. Add enough vegetable oil to lightly coat the bottom of the pan. Brown the salmon lightly on each side and then place on a baking sheet. Bake the salmon for 6-10 minutes depending on thickness. Remove from the oven. Place on a bed of the caramelized leeks and then squeeze a little fresh lemon onto the fish. 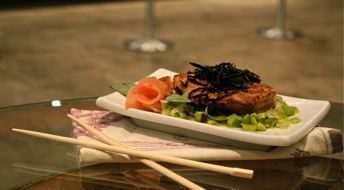 Top with the fried nori to serve. Cut off the root end of the leek and the portion just above the white part into the light-green part. Cut the piece in half lengthwise and rinse between all the layer to remove any dirt. Then cut into ½” thick pieces across the leek to make half rounds, for about 2 cups of cut leeks. Heat a large saute pan over medium low heat, add the oil and then the leeks. Saute until softened, about 2 minutes and then add the mirin and Riesling. Continue cooking until the liquid is reduced by half. Heat about ½” of vegetable oil in a small saute pan, until the surface begins to shimmer, about 350 degree. Drop the julienned pieces of nori in and cook about 5-10 second and remove to a baking pan lined with paper towels to drain. Salt lightly.